You will feel that you’re genuinely “getting more than you paid for” with the Aimpoint Patrol Rifle Optic (PRO). From an EOTech 512.A65, I switched to PRO because I didn’t like the Eotech’s 65MOA ring. It kind of always causes vision problems for my two eyes when open shooting. For me, the reticle’s compatibility with your eyes, brain, and shooting style is the among the optic’s most important aspects. I realized that the Eotech was also a little low for me compared to the Aimpoint PRO when the Eotech is mounted to the top rail straight. Hence, I had to buy an additional riser for it, and aside from the fact that I already wasn’t pleased with the reticle, the height issue helped me decide further that it was not worth it for me. When I saw the optic and mount together, my first impression was “that is one BIG knob…” It’s much bigger in real life than it looks in the pictures; plus, it also sticks out a little more. The Aimpoint Patrol Rifle Optic’s riser, in fact, seems nice. And because I am a gadget type of guy, I had to take it off so I can see how it would look if without it. Immediately, you will realize that you do need the riser, especially if you don’t want to end up with a stiff neck or sore cheek! The knob is also low enough so as it doesn’t interfere with your vision especially when shooting. The PRO’s torque-limiting mount made me pleased. Before, I have seen some top rails have become permanently damaged because of over-tightening rail attachments. But with the Aimpoint Patrol Rifle Optic, once you click it 3x it becomes all set and super secure. Whenever I pick up my PRO rifle or head out the range, I habitually give it a click or 2 so that I can make sure it is tight and all good. Overall, the mount is a beautiful, innovative design that is also very well made. One thing I did after experimenting was that I reinstalled the riser. I tried putting some 242 blue Loc-Tite on the screws to make sure that the screws didn’t tend to back out automatically or simply on their own. This may not be an issue, but with something that’s used for defense, you can never be too careful. I then removed this optic and mounted it several times so I can test the return to zero, but it’s great that I did not have any shift whatsoever in my zero each time. A thing to note though is that you will have to return the PRO’s optic to the same rail slot to maintain zero because moving the optic on your rail will lead to shifting. If you want the optic re-indexed on your rail, you will then need to return and zero your optic and rifle again. Lens covers, a turret cap keeper, and battery are pre-installed on the unit’s optic. The lens covers have a decent quality and look like the same type of cover as Butler Creek’s, but only, it seems better made. The rear cover is clear while the front cover is colored black. Having a combination of clear and black covers works great for a shooter who leaves both his eyes open. (You can get two clear covers though otherwise.) Although you can’t see through the Aimpoint PRO’s optic, the dot still works in superimposing onto your vision, plus you can even make use of the red dot. You can use this in a panic situation and if you have not had the front cap flipped. The cap keeper that is included with the optic is made of excellent rubber, and it helps hold the caps for you. This is a neat feature that prevents you from losing your caps. I have lost quite a lot of turret caps in the past as I set them down then forget and leave without them. The cap keeper connects both of the turret covers for adjustments and the battery cover; thus, if you remove your turret caps, they will remain attached to the optic when you’re at the range. Per click, the adjustment turrets are 1/2 MOA. The Aimpoint Patrol Rifle Optic clicks were somewhat weak; however, when you switch from a screwdriver to a coin, you will feel them a lot better. Probably the reason behind this is because the clicks tend to transfer better through the metal coin than through a screw driver’s plastic handle. Thus, just use a coin so you can make any needed adjustments. One thing more I realized is that my shots were about hitting 1 inch low at 25 yards. If you’re shooting farther, it does open up to 4 inches low at 100 yards while a massive point of impact doesn’t change at all. In CQB situations, 1 inch low isn’t going to make a big difference, plus it will still create your desired outcome on a target that is at torso size. Of course, this is something you might want to practice on as well as discover how much change in the impact it gives you. On this optic is a total of 10 brightness in the settings. Four of these are made for night vision devices, while the other six have supposed visibility without night vision. However, I realized that only the last three brightness settings are visible, and that is even if you are in complete darkness. Thus, the other three settings seem to be not bright enough to see without a night vision and seem to be too bright, on the other hand, for night vision. I kind of use the settings in the positions 8 and 9, and with this dot I discovered that you might want to keep the optic’s brightness as low as possible because the brighter the vision dot, the more it tends to bleed in the dark. Additionally, this is of no real use if you are using the ten setting or the brightest one. It is too bright so that the dot bleeds. Plus, it illuminates the optic’s outside edge around its glass. For CQB or home defense work, I currently have my Aimpoint Patrol Rifle Optic sighted in at 25 yards. However, I have shot mine out to 300 yards, and I was consistently hitting a 4 MOA bull’s-eye without problems. The best way of finding a good zero for you is in finding out the furthest you want to shoot. Once you find this out, you can key in your data into a ballistic calculator then find out where your bullet will be crossing your line of sight. Thus, if you plan on zero to 300 yards, the round that you will fire will be crossing your line of sight at 36 yards before arcing back to your point of aim at 300 yards. The result is a close in zero as well as a ranged zero especially if you need them both. One feature that has attracted me on getting an Aimpoint PRO was that it is waterproof up to 150 feet (for the diver types: 5.5ATA). Even if you won’t be taking your PRO rifle to SCUBA diving any moment soon, this waterproof optic feature is a nice addition. This is great if you live in an area that tends to rain most times of the year. It is just significantly comfortable to know that if a hard rain falls, your optic will not get wet and damaged and continue to function as expected. Another benefit of the Aimpoint Patrol Rifle Optic (PRO) being waterproof is that you can remove the optic from your mount to rinse it off in the sink when it starts getting dirty, grimy, or dusty or what not. This is especially great if you have been running around a muddy range. It is such a good relief, knowing that you can wash off your rifle anytime, let it dry, and get it working again, so you can truly enjoy it without any worries! The Aimpoint Patrol Rifle Optic (PRO) has a battery life of about 30,000 hours that lasts up to 3.7 years, which is good. And although Aimpoint PRO is inferior to the CompM3 regarding battery life, CompM3s is not worth your extra cash because buying a new battery just costs you $6. The 50,000 hours or very long 6.2 years battery life of a CompM3 would just be unnecessarily added price just to get a good optic. So why does it come in just a white box? Well, this is probably because the rifle was designed originally for purchase and use by police officers. 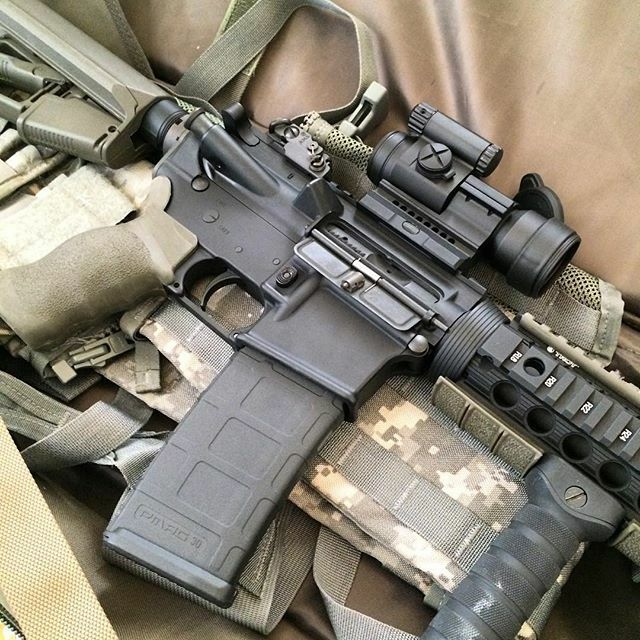 When Aimpoint first introduced PRO, it was purchased only by law enforcement. These police departments, at least most of them, didn’t care more whatever it comes in as long as the item works. Come to think of it; the plain cardboard box packaging also helps keep the price of the Aimpoint PRO down. The box is just something you toss out when you take out the optic and mount it. Honestly, this is a great optic to have for its price. Typically, you can have them for only around $400, and you can also buy them used around the price range of $300. What you get is an optic that is of the same high-end quality of an Aimpoint, excellent battery life, and sheer simplicity that works nicely even for a smaller price tag. Whether you’re in search for a new optic that comes with less hassle or one that has a good, practical battery life, this Aimpoint optic is impressive for its price. Its functions are highly reliable, and it holds a zero well. You can never go wrong with this optic as sure as a red dot sight. Don’t be fooled by its inexpensive price tag. Aimpoint PRO is as solid as an optic should be. It stands up well as any other Aimpoint you can find in the market out there. Posted in Aimpoint, Red Dot Sights, ReviewsTagged Aimpoint Pro, Red dot sight.